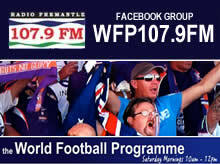 This week Sean Kelly and Don Evans, will be discussing the latest news in local national and international football. Rabeih Krayem the Chair of the Australian Association of football clubs will be discussing the national second Division and his meeting with the FFA earlier this week and the AAFC national speaking tour. Dean Evans Captain of Floreat Athena fresh from the Night series final victory will talk about that and the game against newly promoted Forrestfield at Hartfield park held on Friday night. Sarah Walsh former Matilda and now Match commentator will previewt the Matildas game in Perth, The Womens World cup and the Matildas aim to be the number one nation in women’s football. Peter Saisanis the Glory e-player will be sharing his version of the sport in the ELeague Aus competition. His victory over Wellington last week earned him the inaugural @Themasterbucks Player of the round award. Football Wests’ Alex Novatsis will be talking about the rule changes this season which have certainly engendered some debate on facebook. We will also discuss youth player retention and the ins and outs in the Football West team.